"Lake Taneycomo is one of the best, if not the very best, of all trout streams in the U.S."
the completion of Powersite Dam in 1913. It was originally a section of the White River, and although Taneycomo is now technically a lake, it retains the look and feel of a river. When the Table Rock Dam was completed at Taneycomo's headwaters in 1958, the nature of the lake changed. Taneycomo's water now comes from the bottom of Table Rock Lake, making it a coldwater lake. 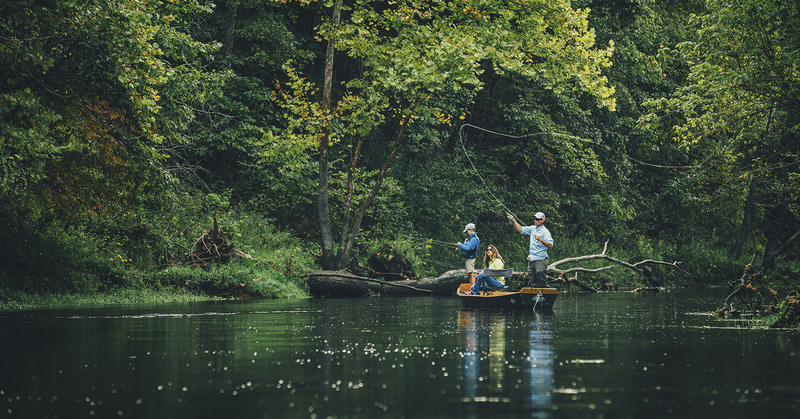 The cold, clear water, stocked annually with approximately 750,000 10-12" rainbow and brown trout, makes Taneycomo a world-class trout fishing lake. Resorts, campgrounds & RV parks and full-service marinas and outfitters offer canoeing, kayaking, fishing boats, motors, guides, tackle, and pontoons for relaxing and fun-filled lake activities. The Taneycomo lakefront in historic downtown Branson is home to the Branson Landing, which includes shopping, dining, lake excursions, boat rentals, all along a 1-mile lighted boardwalk. The uppermost portion of the lake is reserved for artificial lures only such as tiny jigs and crankbaits. These headwaters are also ideal for fly fishing with flies that imitate the freshwater shrimp and other natural bait that trout feed upon. The locals say that the best way to catch trout is by drifting salmon eggs or angleworms. Affix the eggs or worms to a small hook and cast into holes with an ultra light rod and reel. This method used from a drifting boat or from a dock will yield a nice stringer of trout. 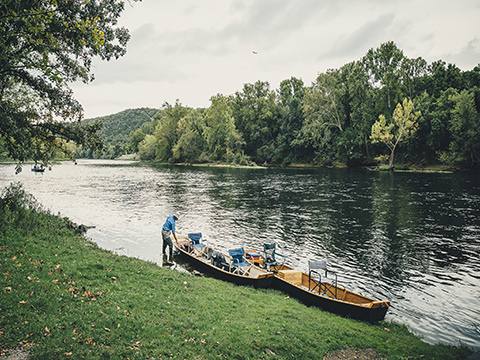 It's important to note that few places in the main channel are shallow enough to fish while wading, so drift boats and docks are typically used. Lower Lake Taneycomo harbors a well-kept secret: The downstream area closer to Powersite and Forsyth offers considerably warmer water and many different species of fish, making Taneycomo a versatile and challenging destination for anglers who are aware of its changing character of this very unique lake. Many area resorts and marinas can hook you up with an experienced guide to help make the most of your Lake Taneycomo fishing experience. 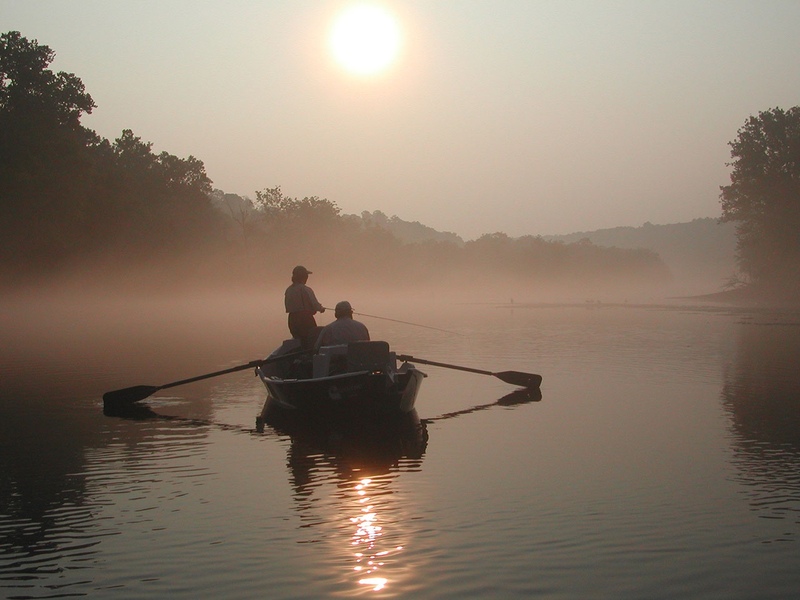 A Missouri fishing license is required to fish any Branson-area lake, river or stream... and a trout permit is required for fishing Taneycomo between the Table Rock Dam and the U.S. Highway 65 bridges. Anglers must have a trout permit to possess trout anywhere on the lake. Resident, non-resident and youth licenses are available at most fishing outfitters and supply stores in the area. For details about licenses and regulations, refer to the Missouri Department of Conservation's site.